You will first drive up the Pan American Highway, passing plantations of coffee, bananas, mangoes and sugar cane. 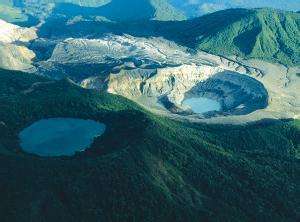 Climb the 8,878 feet (2,708 meters) to reach the active Poas Volcano. The well-maintained paths surrounding the volcano introduce you to the exuberant vegetation of Costa Rica's cloud forest and secondary forest. On a clear day, look for the lake at the bottom of the crater, whose muddy waters change colors depending on the degree of volcanic activity. You'll enjoy lunch at a typical countryside restaurant and in the afternoon visit the small Alajuelan town of Sarchi, known for its wooden crafts that go back to the early 20th century. 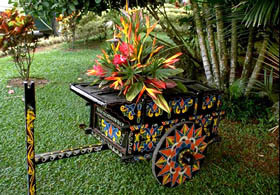 The oxcarts, enriched with ornamental geometric forms, became a tradition not only in Sarchi, but also in other parts of Costa Rica. Oxcarts were used to transport coffee from the highlands to the lowlands. This is a great place for souvenir shopping — everything made of wood from rocking chairs to earrings! It is recommended to wear a sweater or light jacket, and comfortable shoes. Lunch is included (L).